The expanding domestic and global demand of herbal products has put the native medicinal plant resources under significant stress. Wild populations of many medicinal plant species, those growing inside the forests as well as outside forests, have depleted to such an extent that their very survival has become a cause of concern. Whereas several of these species are facing threat of extinction on account of their narrow distribution or endemicity and degradation of their specific habitat, many of these have come to this pass on account of indiscriminate and un-sustainable harvesting. It is a pity that most of these species have never been the focus of any dedicated management intervention. Whereas no management protocols are in existence for the species found outside forests, management focus in respect of the forest species has been primarily on the timber species of high commercial value with little priority accorded to the management of medicinal plants. This lack of management focus has been a cause, as well as a consequence, of inadequacy of data related to the diversity of medicinal plant species being harvested and the quantum of such harvests. 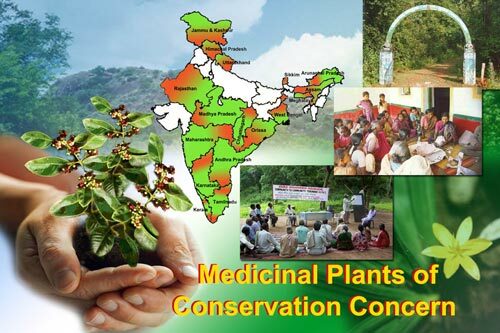 108 Medicinal Plants Conservation Areas (MPCAs) or insitu conservation sites in the country over 2 decades is plotted. This is an effort of MOEF&CC, FRLHT, DANIDA, UNDP, CCF, NMPB, State Forest Departments work. Red-Listed Medicinal Plants App is now available.